This takes “rising above the noise” to a whole new level. 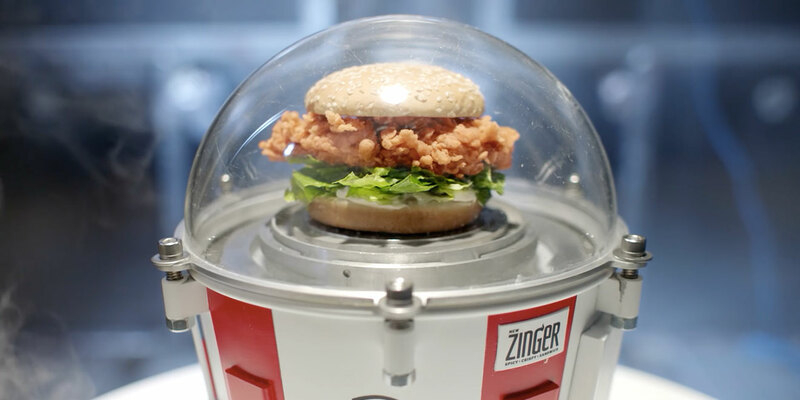 KFC and agency Wieden + Kennedy have revealed more about their plan to launch the Zinger sandwich to the edge of space, announcing a partnership with space flight experts World View. The Zinger is a chicken sandwich that is both spicy and crispy. For the quite reasonable price of $5 when you order a Fill Up meal, you can get one with potato wedges, a cookie and a drink. It’s currently available at KFCs in over 120 countries. Given that space travel is a popular pop-culture topic, and that Red Bull Stratos remains one of the most memorable marketing tactics of all time, it’s no surprise that the Colonel’s fried chicken brand would see the final frontier as fresh colonial ground. It remains unclear when the actual space launch will take place. But World View’s chief pilot, Ron Garan, promises, “There’s probably a half-dozen things on this mission that have never been done before.” Learn more about it below.